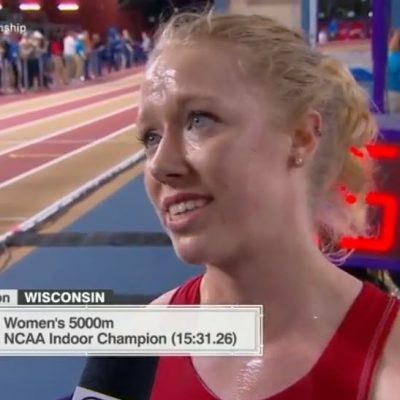 BIRMINGHAM, Ala. — For the second time in two days, Wisconsin’s Morgan McDonald and Oregon’s Jessica Hull crossed the finish line first at the end of an NCAA final. 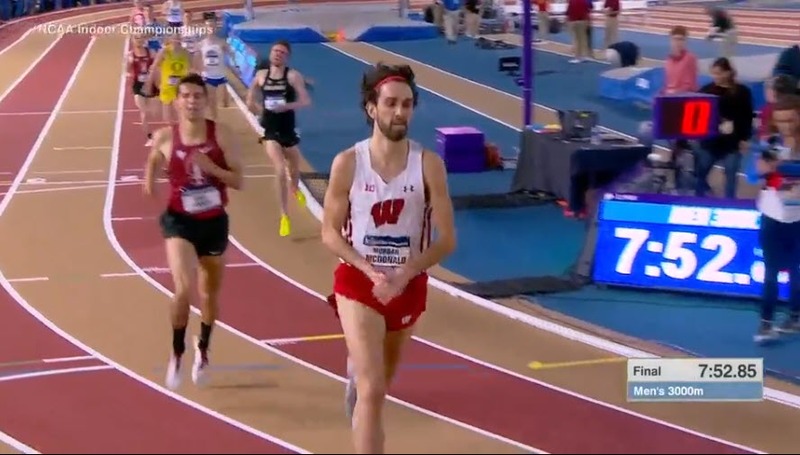 McDonald held off a challenge from Stanford’s Grant Fisher to complete the 5000/3000 double while Hull completed the DMR/3000 double at the 2019 NCAA Indoor Track and Field Championships. At the Millrose Games last month, McDonald lost to Fisher because he didn’t have the lead at the bell. Today, he made sure he was leading coming home as he took the lead with three laps to go. As McDonald moved to the front, Fisher stalked him, running right on his shoulder. But over the final three laps, Fisher never got by McDonald. Coming off the final turn, Fisher was perfectly positioned to pass McDonald as he was on his outside shoulder but McDonald pulled away and had enough of a lead that he was able to glance over his shoulder and let up just before the line as he pumped his right hand to celebrate. After a 54.76 final 400 and 26.32 final 200, McDonald was the champion in 7:52.85 to Fisher’s 7:53.15. Colorado’s Joe Klecker, who was the runner-up to McDonald last night in the 5000, was the only other runner in contention at the bell, but he only had a 27.55 in the tank and he ended up third in 7:54.34. McDonald is the fifth man in the last six years to win both the 5000 and 3000 at NCAA indoors. 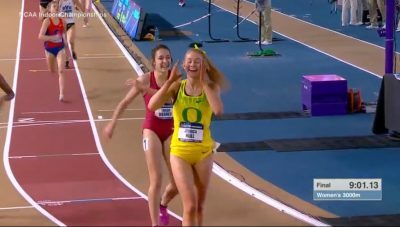 In the women’s race, each of the final six laps was faster than previous one but there was no stopping Hull, who in addition to anchoring Oregon to DMR glory last night also won the outdoor 1500 title last year, over the final 200. Hull took the lead from Arkansas’ Taylor Werner just before the bell and closed in 31.26 (63.68 final 400) to get the win in 9:01.14 to Werner’s 9:01.75. Arkansas’ redshirt freshman Lauren Gregory also scored for the Razorbacks, finishing 7th (9:08.00) after not scoring in the women’s mile earlier. That meant Arkansas got 10 points in the team battle, which they ultimately won over USC by 11. New Mexico’s Weini Kelati, the runner-up last night in the 3000, was third in 9:02.44. When the pace really started going with 800 meters remaining — Kelati, once again, was the one doing the pushing — the big surprise was that Wisconsin’s Alicia Monson, the 5000 winner last night, was dropped. Monson, the third-fastest 3000 woman in NCAA history, only ended up 10th in 9:14.52. Hull’s win means that in each of the last seven years at NCAA indoors, the winner of the 3000 has been either the woman who won the 5000 or the woman who anchored the DMR. Of those seven, five (Kimani, Rupp, Lalang, Cheserek, McDonald) also won the NCAA XC crown that year. But only two, Rupp in 2009 and Cheserek in 2016, went on to complete the “perfect season” by sweeping the 5k and 10k at NCAA outdoors (both men also anchored their DMR to the win at NCAA indoors as well). We asked McDonald, who has never run a 10,000 on the track, whether he would try to follow in their footsteps and attempt the double outdoors as well. Does he feel like he is obliged to give it a try? While it would undoubtedly be cool to see McDonald try to pull it off, running only the 5k at NCAA outdoors and avoiding unnecessary stress may be the smart move for a guy who has battled injury issues in the past. 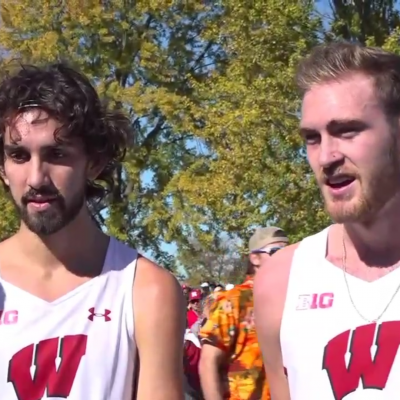 Doubling up indoors made sense as Wisconsin had a shot to score well as a team, but Wisconsin likely won’t be in a position to chase a team title outdoors, which means there wouldn’t be pressure to double McDonald at NCAAs. Quick Take: Finally healthy for an extended period of time, Morgan McDonald is thriving. His secret? Staying off the indoor track. McDonald has always been a big talent, even before he stepped foot on Wisconsin’s campus in the fall of 2014. He ran 8:17 for 3k as a 16-year-old and 14:07 for 5k as a 17-year-old before getting down to 13:29 as a sophomore at Wisco in 2016. The limiting factor, however, has been injuries. This was just McDonald’s second NCAA indoor meet in five seasons, and he’s only made NCAA outdoors once in his career. When healthy, he’s a special athlete, but putting together long stretches of healthy training has proved a challenge for much of his career. His latest setback came around this time last year, after he won the Australian 5,000 title in a big PR of 13:15. But since then, he’s been able to stay healthy, and that has allowed his natural talent to shine through: he now has three NCAA titles in the last four months. McDonald says that this prolonged stretch of health isn’t by chance. He’s worked closely with coach Mick Byrne to figure out which sessions work best for his body, and revealed after today’s race that he did just one workout on the indoor track all season. In our preview of the 3k, we noted that even though Fisher beat McDonald at Millrose, McDonald actually closed faster but lost out because of Fisher’s superior positioning at the end of the race. McDonald knew immediately that he hadn’t run his best tactical race, and tonight he resolved to take the lead before the bell and force Fisher to pass him. McDonald was in good position throughout the race and took the lead with three laps to go. He didn’t have to work too hard to make the pass, which allowed him to shepherd his energy for the last lap, when he really needed it. McDonald ended up closing in 26.32, which would have required a monster effort from Fisher to overtake him on the last lap. Though Fisher was close 26.45, the combination of McDonald’s speed and positioning was too much to overcome. Fisher, for his part, felt he executed well. He said he did not want to try to lead from a few laps out, as McDonald did — the earliest Fisher would have felt comfortable taking the lead was right before the bell — and though he was boxed in for much of the final three laps, he was in position to strike on the final lap when he needed to. Though McDonald has now denied Fisher two NCAA titles in four months, Fisher handled his defeat with grace, seeking out McDonald for an embrace on the track after the race. He was also full of praise for his vanquisher in the mixed zone. Considering Jessica Hull had the #2 time in the NCAA this year at 8:53, it was going to take a big effort to drop her in today’s 3k final. 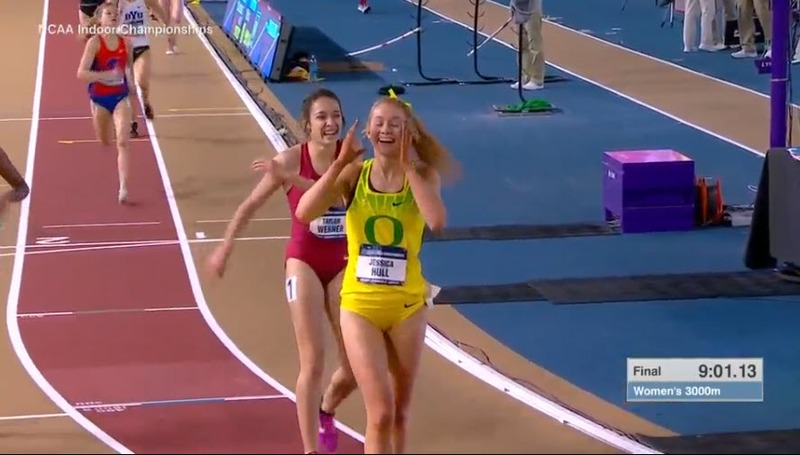 And once Alicia Monson — the NCAA leader at 8:45 and last night’s 5k champ — fell back with a few laps remaining, the outcome looked to be a formality: the NCAA 1500 champ and anchor of the victorious Oregon DMR would get another national title. That’s what happened, but Arkansas’ Taylor Werner made her work for it; Werner had the fastest anchor split last night at 4:30.04, and she capped an impressive meet by hanging on for second tonight. But in the end, Hull was simply too good, and she was able to give her parents — who traveled all the way from Australia to watch her compete this weekend — not one, but two NCAA titles. Werner was still processing exactly what she had accomplished after the race, saying “I’m very overwhelmed right now,” when we spoke with her in the mixed zone. Perhaps that’s because she was running for more than herself: with the team title on the line, Arkansas was counting on Werner and Lauren Gregory to put up some points in the 3k to help them prevail over USC. That was in the back of Werner’s mind coming in, but it got pressed to the front of her mind shortly before the race, creating an extra source of stress. But Werner was able to refocus by the time the race started and performed beautifully. Though Arkansas would have still won the meet without the points Werner and Gregory scored in the 3k, they didn’t know that at the time. 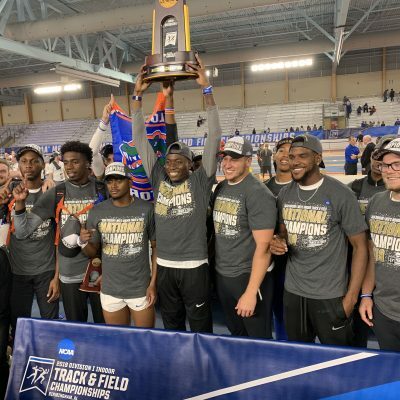 As it played out, the points they scored effectively iced the title before Arkansas added six more in the 4×400. Talk about the meet on our world famous fan forum/ messageboard.